Berliner Weisse, 3.5% ABV, IBU not available (but it’ll be low… very low). Featured in BeerBods Plus box 4 on 15 March 2018. 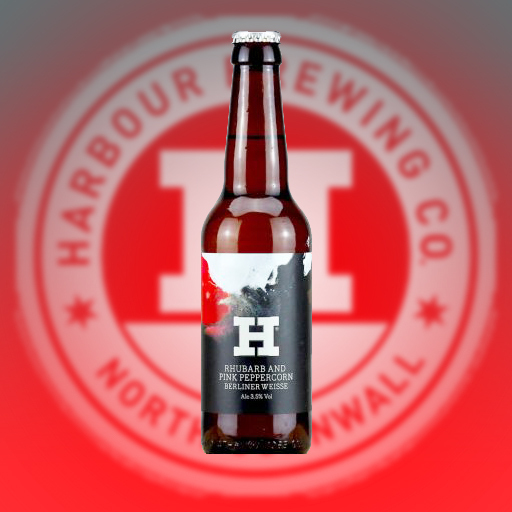 Find the brewery on Twitter at @HarbourBrewing and on Instagram at @harbourbrewing. Serve this beer cold, around 7°C; stick it in the fridge for round two hours so it has time to cool right down. This beer is best served in a wide, bowl-shaped glass. Open and pour carefully. This style of beer can get a bit lively. You can learn more about recommended serving temperatures elsewhere on this site. Berliner Weisse beers are lightly tart, fruity, and highly effervescent. They usually pour a dark-golden in colour with a slight haze thanks to the 25% to 30% pale malted wheat in the grain bill. They are generally quite low-alcohol beers, with this one being no exception. I would expect the rhubarb and pink peppercorn to come through quite clearly. There should be a bit of a lactic acid funky note as well. Hops don’t really feature in this style but look out for fruity esters from the yeast. This is a versatile beer style that can pair well with lots of dishes. You’ll often see it alongside a selection of charcuterie (look for varying levels of salt, smokiness, and spice) and cheeses (cheddar, a washed rind, and a creamy blue work well). The lactic tartness of the beer cuts through the meat’s fattiness and complements the acid of the pickles. You could try it with a cheesecake. Go for one with a fruity topping – ideally rhubarb to echo the beer more closely. I’ve read that Berliner Weisse also goes great with eggs Benedict, although I’ve yet to try that myself. Also: chips. Well… you can never go wrong with chips! Read more on this beer from BeerBods. I couldn’t find any info about this on Harbour’s website so instead here’s a treat for any German speakers, or anyone who finds the idea of Barbara’s rhubarb cake eating barbarians amusing.